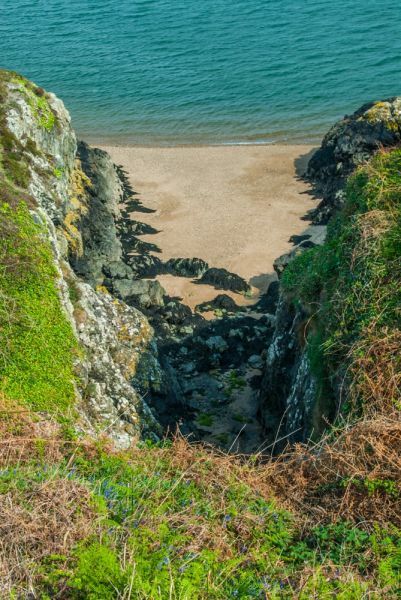 It is hard to know how to classify Llanddwyn Island; on this small islet are the remains of a medieval chapel built upon the presumed site of a Celtic nunnery founded by St Dwynwen (the name Llanddwyn translates roughly as 'the church of Dwynwen'). A few steps from the ruined chapel site are two historic lighthouses. 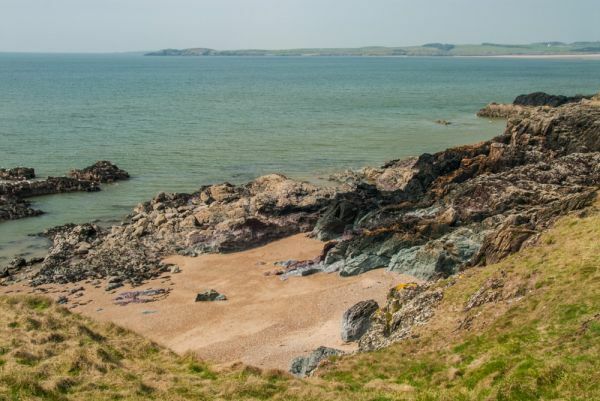 Llanddwyn Island is a tidal island joined to the Anglesey mainland at most times, save during extreme high tides. A sense of history seems to envelope this small, beautiful islet, and it is no wonder. 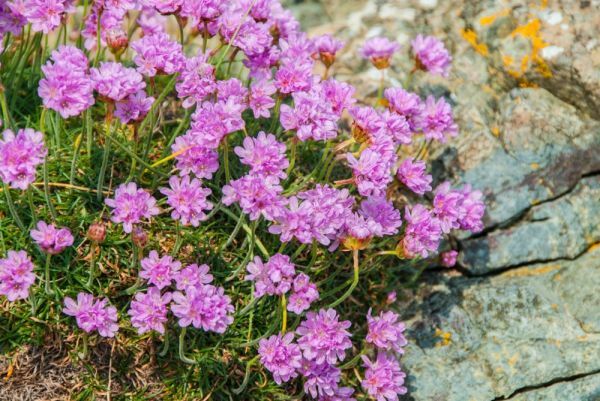 Dwynwen is a Welsh equivalent of St Valentine, and her feast day of 25 January is celebrated with an exchange of cards and flowers, just like Valentine's Day. The tale of Dwynwen is similar in many ways to other female Celtic saints. The daughter of a 5th-century prince of Brecon named Brychan, she was courted by a young man named Maelon. Though she loved Maelon, she rejected his advances. Depending on which version of the story you read, this was because she wanted to stay chaste, or because her father had chosen a different husband for her. In any event, the unfortunate suitor was frozen. Dwynwen then prayed for three wishes to come true. First, that Maelon would come alive once more. Second, that she should never wish to be married, and third, that all true lovers would find happiness. 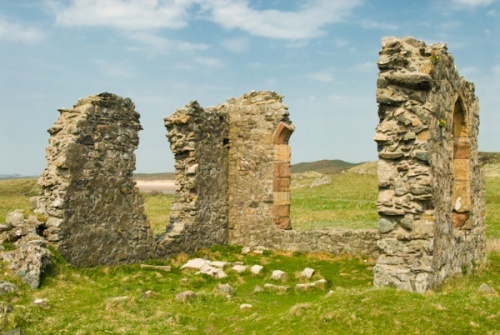 Naturally enough, her wishes were granted, after which she became a hermit on Llanddwyn Island. Her hermitage became a place of pilgrimage, especially for lovers. 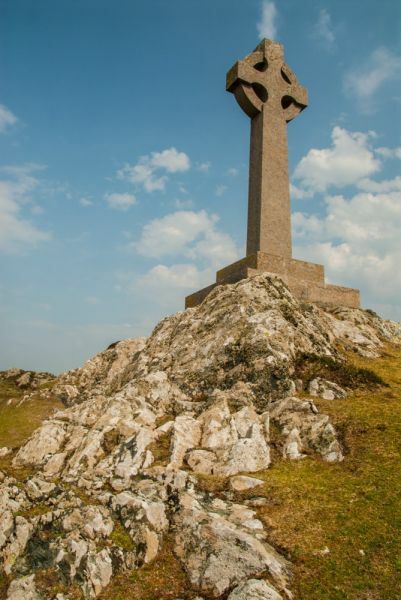 After Dwynwen's death, many pilgrims came to pray at her shrine, and still others to visit her holy well, where, it was said, young women could determine if their lovers would remain true to them. Offerings left by pilgrims at Dwynwen's shrine provided enough money to build a substantial chapel here in the 16th century, on the site of the original 5th-century shrine. 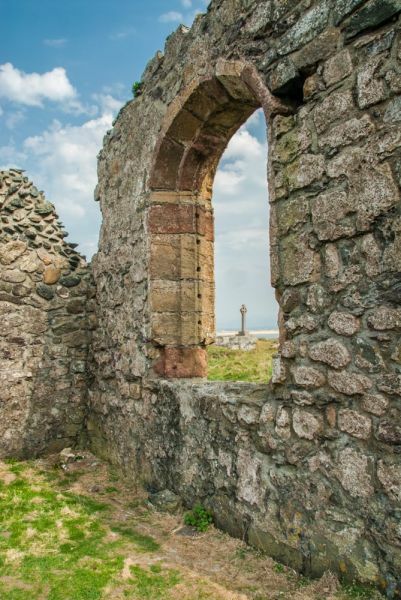 The tumbled remains of the chapel still stand today, though they are very ruinous. 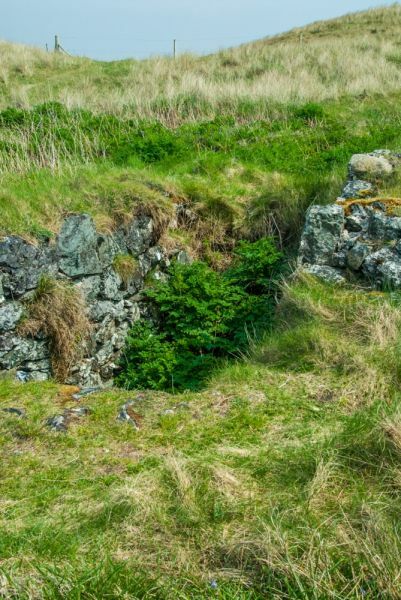 Almost immediately upon reaching the island you will find the holy well, to the left of the path. The path then continues up a small rise to the site of the chapel. Beyond the chapel is a small whitewashed lighthouse. 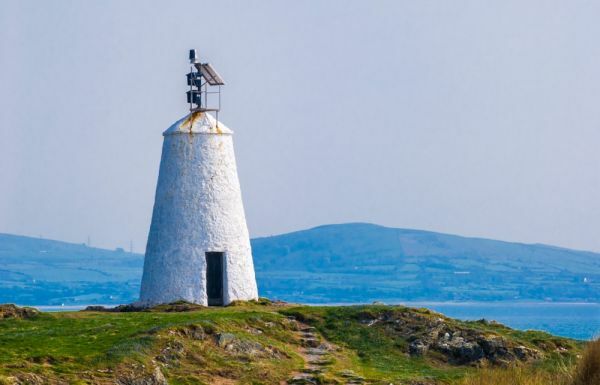 This is one of two historic lighthouses on the island, situated at the entrance to the Menai Strait between Anglesey and the Welsh mainland. The first 18th-century lighthouse, named TÅµr Bach, was replaced in 1845 by a more substantial building, TÅµr Mawr, a cylindrical structure modelled after Welsh lighthouses like Llynnon Mill. The earlier lighthouse was then refitted with a modern mechanism and it now acts as the main lighthouse for the island. Beside the lighthouse two whitewashed cottages, formerly used by pilots who guided ships through the shifting channels of the Menai. 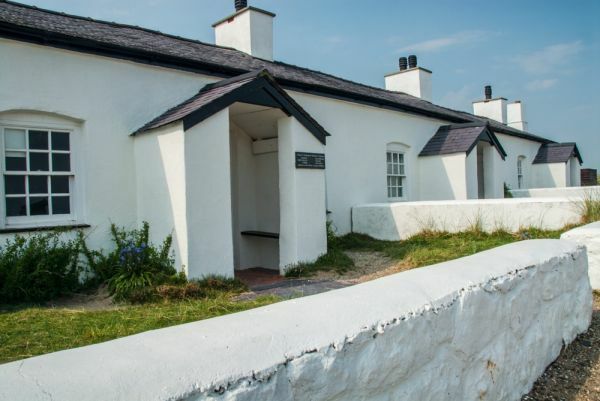 One of the cottages has been restored and houses a display on local wildlife. The only way to reach Llanddwyn is on foot, via pathways through Newborough Forest plantation, then along the sandy beach to the islet. A fee may be payable to enter the plantation. 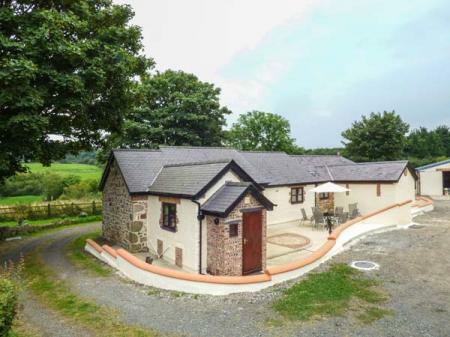 The location is utterly superb; there are wonderful views east to Snowdonia and south to the Lleyn peninsula. More than that, there is something magical about Llanddwyn, some ancient aura clings to this beautiful site. Our family came here in the late afternoon when the sunlight was fading, sending long shadows across the beach. It was an amazing feeling, seeing the holy well, and standing inside the ruined chapel walls. This is a place you could come back to again and again. Location: On a tidal islet just off Newborough Forest plantation. Access through the plantation or along the shore from the Newborough Warren parking area at Pen-lon. This stone-built terraced barn conversion in a courtyard location is close to the village of Newborough on Anglesey and can sleep six people in three bedrooms. This lovely barn conversion is in the village of Pentre Berw near to Newborough and can sleep six people in three bedrooms.